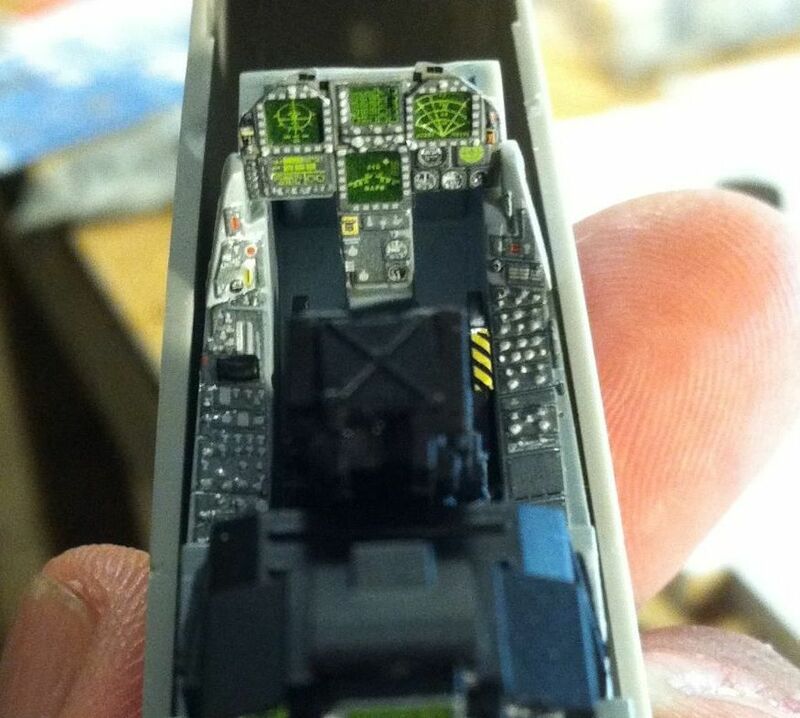 The heart of any good model has always been a well detailed cockpit. But it can be the trickiest area of the model to detail particularly if the kits parts are not up to scratch. Looking at what’s on the market, Afterburner has come to the conclusion that using decals is a good way to go. So they have released their first dedicated detailing set for the cockpit and the subject is the Hasegawa F-18 Super Hornet, ironically a kit which has very good cockpit detail. What these decals do provide is the sort of printed detail that would be very difficult for most modelers to reproduce. The decal sheet is a tad smaller than A5 and is packed with details for the cockpit instrumentation, monitors, seats, landing gear, gear doors, counter measures dispensers and exhaust petals. The decals themselves are printed by Cartograf so the quality is assured. There are enough decals for two aircraft. Cockpit: Both of the crew positions have a myriad of individual decals for the instruments. It looks as if there is a choice of having the monitors on or off. If you go for the on mode, then there is some great detail including maps, TV images, radar and flight status images. The detail is superb and well worth looking under a lens to see the quality of the printing by Cartograf. Afterburner claim that the one piece decals for instrument panels and the side console will conform perfectly over the raised switches, knobs and buttons. I have included images of a test subject [an F-2] from Afterburner Decals that illustrates the decal instruments in place. So you can make your own minds up. Afterburner has included instruments for the early instrument panels and also the later ACS panels not only for the Hasegawa kit, but also for the Steel Beach aftermarket ACS panels. Also included are decals for the seat harnesses and the ejection seat. Airframe: This release has decal detailing for the airframe, pylons, undercarriage, including the doors, and the engine nozzles. The Bard stacks to the rear of the fuselage and the counter measure dispensers are included. The recessed counter measure dispenser detail on the kit needs to be filled in. Afterburner supplies the decals for the dispensers themselves and separate decals for whatever counter measure package you fancy. They are colour coded red, white or yellow. There is a decal for the towed decoy guide mark and the navigation lights for upper and lower the wings. Undercarriage: There are many placards provided for the undercarriage legs. The coloured lights for the front undercarriage leg are also supplied. For the first time as far as I know, decals are provided for the painted red lining around the undercarriage doors. These are usually painted by brush or penned in with red permanent marker. There is absolutely no carrier film visible around these decals [that’s true with all the decals] so the decals are very thin. This presents some problems of transferring the decals to the doors, but they offer such a true fine red line that would be difficult to reproduce by hand. It is possibly worth considering perhaps cutting the more complex shapes into sections to make the transfer from the sheet to the doors a little easier. Exhaust cone: there are decals for the white squires seen inside the cone and also to emphasise the interior joints of the petals. The instructions are printed on three sides of a folded A4 sheet of paper. The instructions are beautifully illustrated in colour and provide upper and lower plan views of the subject. There are numerous scrap views of other parts of the aircraft. The only tricky part will be the placing of the individual decals for the instruments. These decals are not numbered so to place them correctly you must carefully compare the images with the decals. Just take your time and number them yourself. Although using water slide decals for instrument panels has been around a long time, Afterburner seems to have taken the use of this medium a step further. This new release offers the sort of detail that pre painted photo etched parts can’t do at the moment. Love them or hate them detailing with decals does provides the modeler with another string to their bow. Highs: A very good alternative to detailing the cockpit and airframe. Lows: Some tricky manoeuvring of some of the thinner decals. Will the decals for the instrument conform to the raised detail? Verdict: A very good alternative to hand painting and using photo etched parts whether pre coloured or not. Nice one Afterburner. They will in fact conform perfectly...this is the way they were designed. If you sand off the raised detail, you'll lose the 3D effect desired.